On July 16, 1997, the Chiong sisters Marijoy and Jacqueline disappeared at a mall in Cebu and were allegedly raped and murdered. Seven young men known as the Chiong Seven were deemed responsible for the crime, and Paco Larrañaga, a great-grandson of the late Philippine President Sergio Osmeña, was one of them. Paco was a culinary arts student who was in Manila on the day the crime happened, as confirmed by witnesses (teachers, classmates and staff members of his school) and photographic evidence. Paco, along with the other suspects, were given two life sentences, which was later changed to a death sentence. The case was so controversial that it merited the attention of the Spanish Government and the United Nations Human Rights Council. The Spanish Government asked former President Gloria Macapagal-Arroyo to grant Paco clemency, and in June 2006, the Philippines’ death penalty was abolished. Paco is now serving the remainder of his life sentence in Spain under a bilateral agreement between Spain and the Philippines. Paco has already spent 15 years in prison, and up to now, he still insists on his innocence. 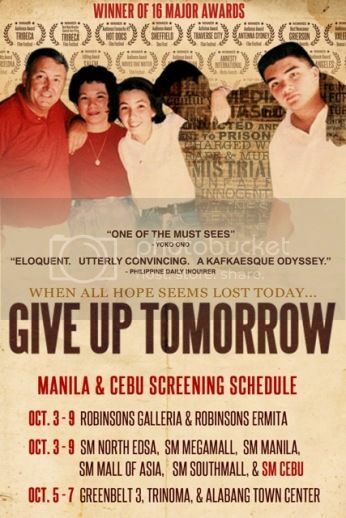 Give Up Tomorrow if a feature documentary film by American director Michael Collins and Filipino producer Marty Syjuco. Marty Syjuco’s brother Jaime is the husband of Paco’s sister Mimi; this was something that Marty never hides or denies. This documentary attempts to prove Paco’s innocence using interviews with forensic experts, political analysts, journalists and major players in Paco’s case and pieces of evidence that were left uncovered for so long. It also exposes the messy scheme of events surrounding the trial, as well as the complexities that permeate Philippine politics and culture. Give Up Tomorrow has played in over 50 film festivals in more than 25 countries and has won 15 major awards, including 7 Audience Awards, 4 Human Rights Awards and the Activism Award at Michael Moore’s Traverse City Film Festival. Last night, I went to SM Movieworld at SM Megamall alone to watch the documentary film Give Up Tomorrow. I stayed glued to the movie screen for almost two hours absorbing everything and getting shocked by some revelations. It was disturbing, disheartening and mind-boggling to say the least. I had so many questions in my mind that needed answers, and I left the movie house with a fervent hope that the truth will finally be revealed for everyone’s peace of mind. SM Manila, North Edsa, Megamall, Mall of Asia, Southmall, and SM Cebu from October 3 to 9. Ayala Trinoma, Greenbelt 3, and Alabang Town Center from October 5 to 7. This entry was posted in Chiong Seven, Chiong Sisters, Give Up Tomorrow, Paco Larrañaga. Bookmark the permalink. i have read the story of the two sisters , i guess they have different version and yes the story is indeed shocking and really heartbreaking for the family. The truth may not be unravel in this time but i guess, the fact that there is an evidence to prove his guilt, it can’t be denied. I don’t recall about this news, maybe because I was 12 years old when this happened and i am not interested in it at all. But now that you mention it I will ask my parents about it. My father , maybe, has some insights about it. I hope I can watch that documentary. I remeber this case. I believe I was at the same age as the older Chiong sister when they were murdered. This is very interesting, Tetcha! I have to see this documentary! I have no recollection of this news. But it sure does look interesting enough. Will watch out for this. I remember this case. Awts too bad it is not shown here in Bacolod. I remember this case so well. I think it was one of the most controversial cases during that time. I think this documentary makes it more controversial as the suspect and his family went to even greater lenghts to prove his innocence. How I wish I could watch the documentary here in Iloilo; i’m sure it’s very interesting.